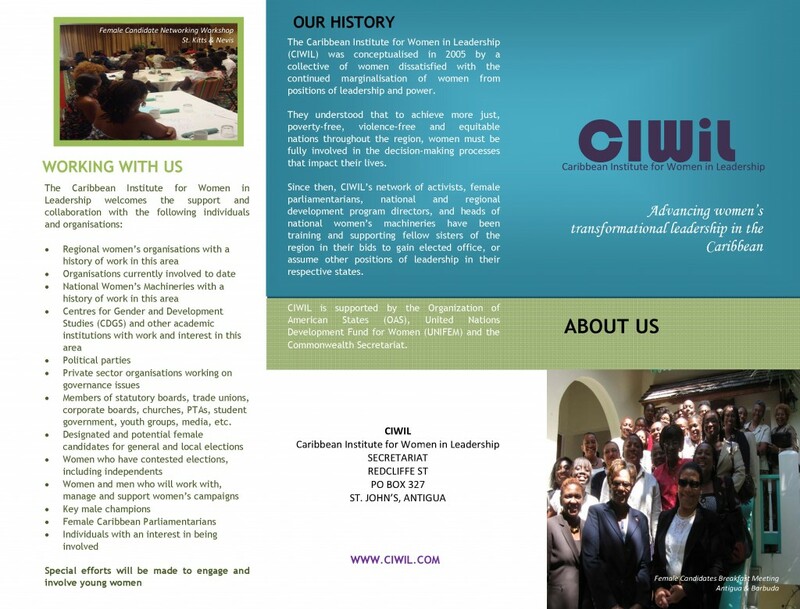 The Caribbean Institute for Women in Leadership (CIWIL) was conceptualised in 2005 by a collective of women dissatisfied with the continued marginalisation of women from positions of leadership and power. They understood that to achieve more just, poverty-free, violence-free and equitable nations throughout the region, women must be fully involved in the decision-making processes that impact their lives. Since then, CIWIL’s network of activists, female parliamentarians, national and regional development program directors, and heads of national women’s machineries have been training and supporting fellow sisters of the region in their bids to gain elected office, or assume other positions of leadership in their respective states. CIWIL is supported by the Organization of American States (OAS), United Nations Development Fund for Women (UNIFEM) and the Commonwealth Secretariat.